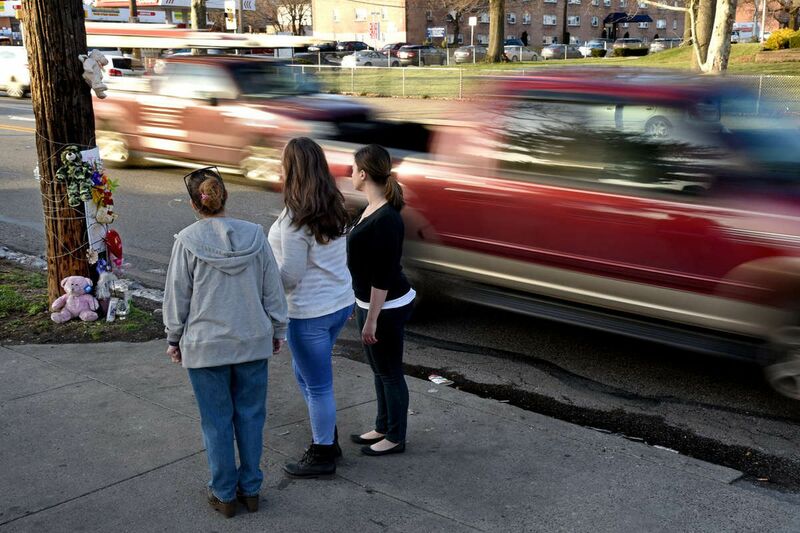 Danny Dimitri’s sister, Cheryl Dimitri Prosinski (left) and her daughters, Stephanie Prosinski (center) and Brittany Prosinski (right), visited his memorial on Cottman Avenue in March 2017. An off-duty police officer who authorities believe was racing a fellow off-duty officer when his car struck and killed a pedestrian in Northeast Philadelphia in January 2017 pleaded guilty Tuesday to a felony charge of homicide by vehicle and a misdemeanor charge of involuntary manslaughter. It was about 11:30 a.m. on Jan. 31, 2017, when the Subaru driven by Adam Soto slammed into and killed Danny Dimitri as he was crossing Cottman Avenue near Algon Avenue. After the hearing, Assistant District Attorney Cydney Pope said surveillance video indicated that Soto "appeared to be racing" along the road at the time. Soto's attorney, Fortunato "Fred" Perri Jr., said Soto was driving faster than 80 mph on the road. The speed limit in that area — just outside of Northeast High School — is 30 mph. "He's accepted responsibility for this conduct, which resulted in this sad and tragic result," Perri said after the hearing. Soto, 25, who worked in the 24th Police District, was fired by the department after his April 2017 arrest on the charges. Free on bail, he is to be sentenced Jan. 11 by Common Pleas Court Judge J. Scott O'Keefe. Dimitri, 50, worked as a chef at Chuck's Alibi, a seafood restaurant on Oxford Avenue in Burholme. He was crossing the street to catch a bus to go to work to pick up his paycheck, according to his family. The race apparently was between Soto and another off-duty officer, Tony Forest, then a three-year veteran in the 14th District. They had left a gym and were driving separate vehicles. Forest, driving a Mercedes, had another off-duty officer as a passenger in his car. A source with knowledge of the investigation has said that while Soto accelerated until he struck Dimitri, the Mercedes driver slowed and stopped at a traffic light that Soto sped through. The District Attorney's Office last year concluded after an investigation and review of evidence, including video, that there was insufficient evidence to charge Forest. Even though Forest wasn't charged, Police Commissioner Richard Ross fired him; his last day was May 22, 2017. Forest was also cited for speeding.